For over a century the roads of northern Europe have been home to the toughest bicycle races in the world. The most famous of these, Paris to Roubaix, takes place each spring over brutal cobblestone roads that have been preserved in their historic condition for over 100 years. Inspired by this classic race, the Paris to Ancaster has taken place for the past twenty four years over the roughest farm lanes, trails and gravel roads we can find. Combined with unpredictable spring weather and the largest field of riders assembled in Canada, it has become a classic race experience for everyone from average riders to Canadian Olympians. Join us on April 28, 2019, our 26th annual event, to become part of the history of this unique race. 3 DAYS LEFT FOR ONLINE REGISTRATION! Almost time for the P2A! You can register for the P2A20 Family Ride and P2A70 Wave 4 on line until Monday April 22 at 11:59pm. If you want to race then P2A70 Wave 4 is your only choice. Once on line registration/services closes on Monday April 22 at 11:59pm we won't be accepting any more changes, transfers, etctera. One of the big questions we get is can I change waves? Yes, when you pick up your race number on Saturday, go to the Wave/Event Change Table to see if a spot is available in the wave you want. Be patient - riders frequently switch waves or move from the 70km race to the 40km race, leaving openings to be filled. Please appreciate that if you want to move up a wave then someone else has to move down. It is done on a first come, first served basis. We can't guarantee that you will be able to change waves even if you are waiting. There is a fee for wave changes. This is a first for the P2A - Pre Ride Maps. We have 3 loops - 10, 20, and 30 km, and a 60K point to point from Paris To Ancaster. These Pre Rides avoid private property and also public property where trail damage may occur due to early spring use. Please use common sense - if it rains 10mm the day before you want to pre-ride it probably isn't the best day to be using anything other than pavement. One of the key features of the P2A is the opportunity to ride private trails and property that is unavailable for public use the other 364 days of the year. A key part of our "deal" with the landowners is that we respect their privacy and stay off their land other than during the race. Unauthorized pre-riding of private property is trespassing and can lead to loss of our ability to use private lands, and ultimately could affect our ability to present this unique event. CLICK HERE or the MAPS button above. Your friends and family can follow your rides, leave you a real-time note of encouragement (or trash talk if you have that sort of relationship! ), and be notified when you get home safely. SPOKZ also takes the guess-work out of meeting up with friends for a ride or reconnecting if someone gets dropped. For P2A, SPOKZ has added a race mode. If you join P2A on SPOKZ, your live race stats and location will be posted to a public feed during the race. Spectators will not only be able to follow friends and family who are racing, but follow the overall race with the SPOKZ app. Stay tuned for more details leading up to the race! The P2A was gravel before gravel was cool! For 2019 a number of world-class UCI Continental Road teams will start their season at the 26th Annual P2A. While the trend of gravel events is rather new, P2A has been around a long time. The race has always attracted world-class UCI-ranked individual riders from all disciplines. Race alumni include UCI Cy-clocrossers Helen Wyman and Jeremy Powers, and Mountainbike Olympians Alison Sydor and Emily Batty. Floyd’s Pro Cycling, a brand new team featuring up-and-coming talent including Canadians Nick Zukowsky and Emile Jean, is planning to take their primarily road team to a few gravel events, starting with P2A, and are ready to challenge for the win. X Speed United, another newly-formed team comprised of riders from Canada, Australia, and Hong Kong, will also be sending a delegation to ride P2A, including Guelph-native Ryan Roth. Roth is a pro at the Continental team level for 15+ years, and who’s credentials include a Tro-Bro Léon win (and a 10th place at the 8th annual P2A in 2000). Joining Floyd’s and X-Speed United at P2A19 is Team CCB Siclari, a U23 squad focused on developing young athletes as they attend post-secondary. The team includes this year’s U23 Pan-American champion Spencer Petrov. UCI teams from the world of MTB will be making an appearance as well. NORCO, a long-time sponsor of P2A, brings the Disera Brothers, Peter and Quinten. Now a pro cyclist on the Mountain Bike circuit, Quinten Disera won the P2A 40km event in 2013 when he was just 15 years old. It’s going to be a busy call-up line at this year’s event, with an impressive roster of teams featuring seasoned road & mountain champions vying for a P2A win. “This is the first time that Continental pro teams have approached us about riding in our event as a team” said co-race director Tim Farrar. “It shows the growing influence of gravel and mixed-surface events in the cycling world. Team sponsors and directors, as well as riders, are starting to take this se-riously as an alternative to traditional road and mountainbike racing”. This five-year financial commitment from P2A will directly help the National Team program by offsetting the costs associated with providing mechanical and coaching support to national team athletes while at international competitions. P2A Race Director Tim Farrar says, “In a sense, P2A is simply doubling down on a year’s long commitment to provide what support we can. The National Cyclocross team athletes and staff can count on us for the next 5 seasons…at least”. Athletes and staff of the National team have often become P2A’s biggest supporters and unofficial ambassadors for the race, raising the international profile of the event. P2A and the CX National Team already have a ‘Win, Win’ partnership, says Tim Farrar. Cycling Canada officials hope that this increased level of partnership will allow them to better promote the Canadian spring classic abroad and will help continue to grow the level of support they offer our National team athletes. 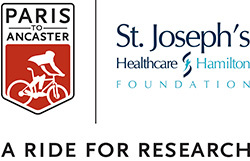 Back for 2019, St. Joseph’s Healthcare Foundation is proud to be the official charity partner of the Paris to Ancaster Bike Race. Now novice and expert cyclists alike can ride to support research at St. Joe’s. Whether you choose to fundraise on your own, or as part of a corporate or friends and family team, every dollar you raise will be supporting vital healthcare research. St. Joe’s is a research powerhouse in areas like mental health & addictions, kidney & urinary care, lung diseases, critical care and much more. The funds you raise through this Ride for Research will help to create a healthier future for all of us. CLICK HERE to raise funds for St. Joe's in the 2019 Paris to Ancaster Bike Race.